Title: 'The Kingdome Of Scotland', published by Bassett & Chiswell. 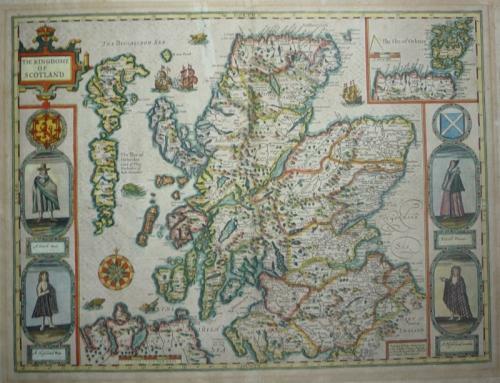 A famous map of Scotland, with an inset of the Orkneys, and representations of local people. This map was first issued 1611-12, with decorative portraits of James VI of Scotland and I of England, his wife Anne and their two sons. However in 1652 the Puritan ascendancy made it politic to re-engrave the plate: away went the Royal family, to be replaced by costume vignettes of a "Scotch" (i.e. lowland) man & woman and their wilder "Highland" neighbours. The checked garments worn by the second pair are considered to be one of the earliest depictions of tartan. The map has been framed in the past, so there is some shading around its borders. A small repaired tear can be seen just to the north-west of the most northern tip of Scotland.